Lipodox Injection distributors, dealers & suppliers in Mumbai. 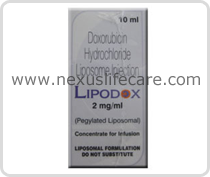 Uses:- Liposomal doxorubicin Medicinie is an anthracycline type chemotherapy drug that is used alone or with other treatments/medications to treat certain types of cancer (e.g. ovarian cancer, AIDS-related Kaposi's sarcoma, multiple myeloma). It works by slowing or stopping cancer cell growth. Side Effects:- Body aches/pains, headache, nausea, vomiting, constipation, diarrhea, stomach upset, and loss of appetite may occur.